Innerdrive conveyors from QC Industries are just 2.54" tall, and with motorized rollers instead of a bulky drive motor, they fit nearly anywhere. The Innerdrive motor is safe, high-efficiency 24vdc with integrated gears for maximum torque and almost nonexistent maintenance. You won’t be lubricating bearings or drive packages—ever. Since it’s very low voltage, this motor also reduces energy consumption and helps cut risks for workers working near higher current systems. It moves up to 50 feet per minute and can handle loads up to 75 pounds. These conveyors are available in standard flat models, but can also be built at an angle (Z, R, or L configurations) for flexible operations. They use Z-Track technology to make belt tracking easy, consistent, and worry-free. 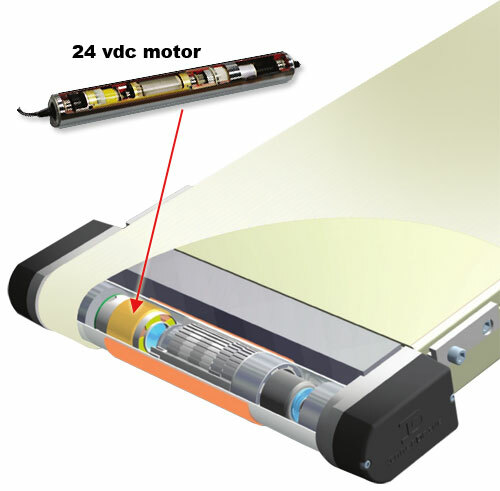 With a variable speed control that integrates easily with automated systems, machinery and other conveyors, Innerdrive systems can fit nearly any “run on demand" application. They utilize inhibit/run controls from devices like photoeyes, sensors and more. Lighted indicators can be frame mounted or in any NEMA 12 control box. 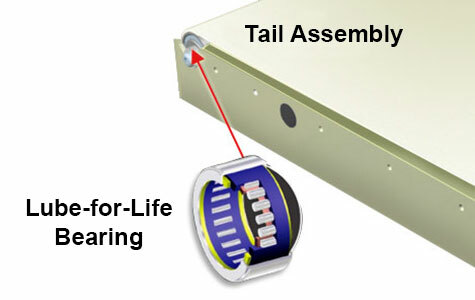 Due to its unique snap-in, sealed tail assembly, belt changes are quick and painless. The bearing is one you’ll never fuss with, since it is “lubed for life" and eliminates the need for maintenance. You won’t ever see grease around it, or on the floor beneath it, making it ideal for sensitive applications where the environment or load won’t tolerate grime or grease. Lengths: 24" to 144". Actual conveyor length for conveyors 72" or longer is nominal length minus 1.12"; for conveyors under 72" subtract .81" from nominal length. Available Control Wire Lengths: 12", 24", 48", 96"